Your Baby Will Go Gaga For This Soft Activity Gym From Infantino. It Has A Musical Mobile, Wooden Teethers And Plush Toys With Fabric Tags That Keep Curious And Chubby Hands Busy. Plus, There'S A Baby Mirror Toy. 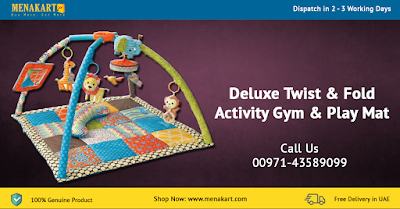 Best Of All, You Can Take This Deluxe Twist And Fold Activity Gym And Play Mat Anywhere. It'S Great For On-The-Go Fun.